Liverpool Animal Shelter is a no-kill impounding facility servicing residents of the greater Liverpool City Council Local Government Area. We provide a safe and caring Shelter for all impounded animals as they wait to return home, or find their new family. All listed animals on this Pet Rescue account have completed their mandatory holding period and are up for adoption. Interested? Then head on out for a visit! We are open 10am to 3pm daily. Come on out, meet our guests, and talk to one of our friendly staff about turning their dreams of a new home into reality. Don't forget to bring all family members, including resident canines! 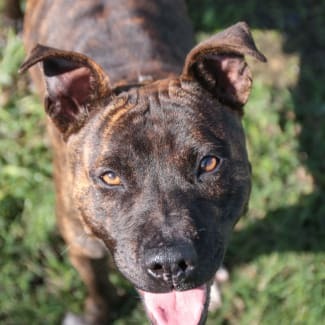 Affectionate, confident, resilient and bouncy, Axle is a lovely little staffie seeking a loving home. A 12 month old brindle boy, Axle is as sweet as they come. He knows how to sit and walks well on-lead. Although not suitable to go to a home with pocket pets or cats, he has had a match up with another one of our dogs and behaved perfectly. So we think he's able to go to a home with another dog. At 19 kilos, Axle is a medium sized boy and not super-chunky, so pretty easy to manage. Come along and meet Axle today! Bring your dog/s out for a match up too.